Although December’s Purchasing Manager’s Index (PMI) slipped from November’s level and was below general expectations, it is not likely a signal of a material weakening in the economy. The all-important New Orders sub-index moved down to be sure, but from a red-hot November reading to a still-strong level in December. Furthermore, while one can’t be sure what, if any, impact the West Coast port work slowdown might be having, a number of PMI respondents said it was weighing on their businesses during the month. ”“The past relationship between the PMI® and the overall economy indicates that the average PMI® for January through December (5.8 percent) corresponds to a 4.2 percent increase in real gross domestic product (GDP) on an annualized basis. In addition, if the PMI® for December (55.5 percent) is annualized, it corresponds to a 4.1 percent increase in real GDP annually. [For context, real GDP has been running around 3% on a year-over-year basis. —Ed.] A PMI® in excess of 43.2 percent, over a period of time, generally indicates an expansion of the overall economy. 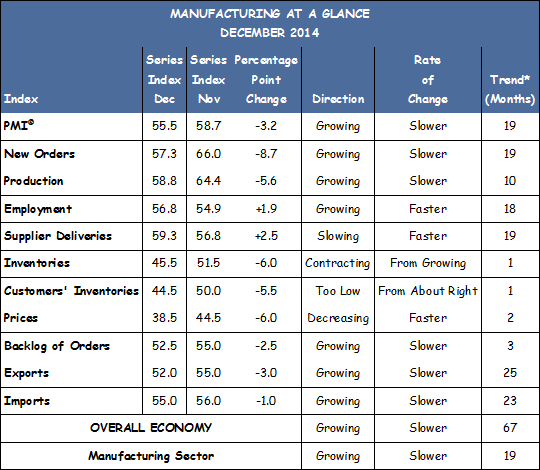 Therefore, the December PMI® indicates growth for the 67th consecutive month in the overall economy. As the economy grows, the corporate profit up-cycle remains in place. Such an environment supports stock valuations, and suggests the bull market remains in place. Report details are in the table that follows.